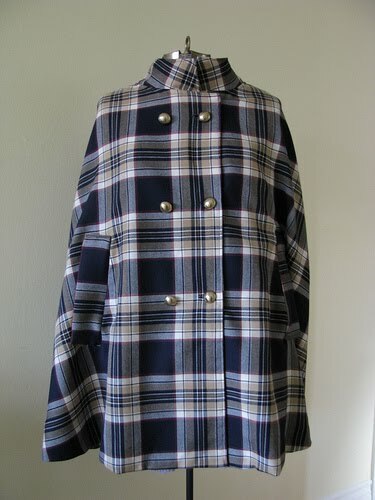 One year ago today I was cutting out the pieces to make my A.P.C.-inspired plaid cape. It's still one of my favourite things that I have made. omg that is one of my favorite things ever!!!! so amazing! Stop it, just stop it with the jealous inducing coat making! And a cape? Oh my, the key to my heart indeed. This is just so perfect!The buttons, the plaid - I adore it. gorgeous. you should be very proud. also, i really love the idea of posting about and appreciating something you already own. Wow, that cape is a show-stopper. I also concur with Chelsea that it's really nice to stop and appreciate the things we already own. I find it's always easier for me to pine for what I don't have. ave you thought of taking commissions, i woudl be up for commissioning you- but in a serious, no strings attached, no having to give me special friend pricing either. maybe this could be a reason for me to come fabric shopping in toronto too!